January | 2012 | ohdenny. They don’t particularly have a great range of dishes to choose from, but they do have all your standards offered in many Malaysian restaurants here. 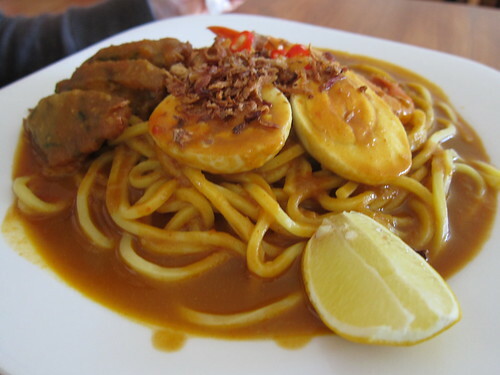 One that seems to be on more Malaysian menu’s now is the Mee Rebus, and luckily for those Mee Rebus lovers out there, this is on Nanyan Kopitiam’s menu. I’ll first talk about their Nasi Lemak. You get your choice of Curry Chicken or Rendang Beef like most Malaysian eateries, I often choose their Rendang since I like the flavours more so than your usual curry. It’s probably also that I often have Curry Chicken at home anyway. 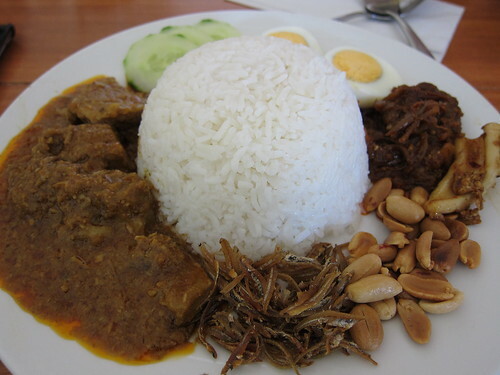 Their Nasi Lemak also comes with your standard sides, so nothing out of the ordinary here. Their Rendang was a bit too tough for my liking, I think it’s because they hadn’t cooked it long enough but the sweet and spicy flavours were all there. I did enjoy it to be honest but the toughness was a bit of a letdown. The sambal was overly sweet, and lacked that chilli punch that Taste Of Singapore has. Overall it was a decent meal, and if you’re in those parts of town their Nasi Lemak is definitely okay. I had a little taste of their Mee Rebus and it was quite good but it was odd because their sauce was extremely watery but it had all the essential flavours in it. I’m usually used to a thicker gravy but although this was different in looks, the taste was all there. 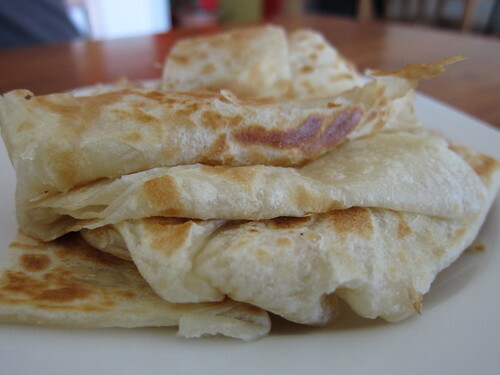 Probably the stand out for me was their Roti Canai. Their curry was delicious and had loads of flavour. It wasn’t too creamy and had just enough spice and heat to it. Along with their fresh roti (Their own roti if I’m not mistaken), that was nice and crisp on the outside but soft inside, I couldn’t really fault it. Nanyang Kopitiam’s Char Kway Teow looked great. I only had a small taste of this as well, but again, it had a good balance of flavours and spice to it. 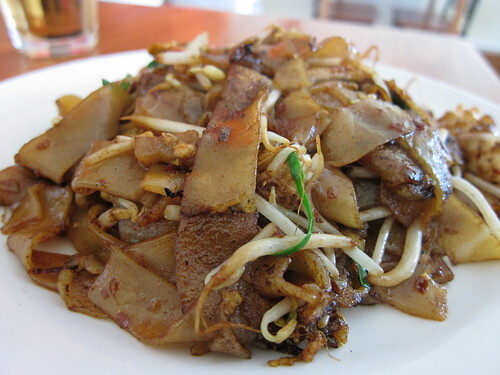 People rave about Straits Char Kway Teow as one of the best in Victoria but this isn’t too bad either. Strangely enough they say Kopitiam but it lacks many of the drinks you may find in a Kopitiam like for instance, Teh Tarik. I can’t remember if they served Coffee but I have my doubts. 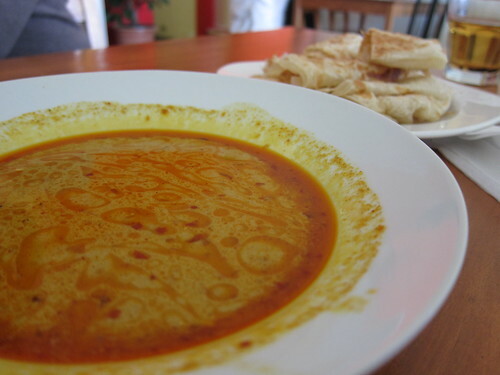 All in all, if you’re in the area Nanyan Kopitiam will satisfy your Malaysian cuisine cravings. Even if you’re not , it’s decent enough to give it a try. 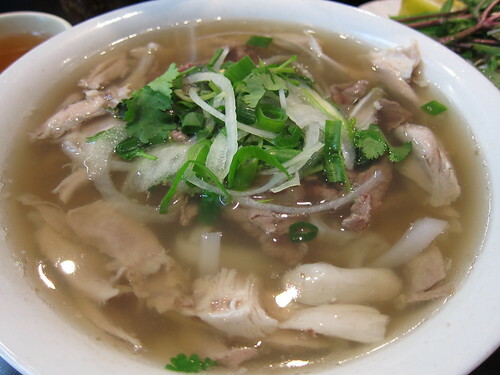 I Love Pho is located in the heart of the Richmond-Vietnamese community. On Victoria St, I Love Pho is a popular destination to order some delicious Pho. It appears it only does indeed serve Pho, but please correct me if I’m wrong. During lunch hours, the service appears average at best, though, it depends on how you look at it. You order and get served very quickly, but it’s mostly a rushed environment to get as many people in and out as they can. Onto the Pho that I did try, the beef was quite nice and seasoned and still slightly rare which makes it all the better, as the very popular restaurant in Springvale well known for their Pho has chewy and tough beef. The chicken was also soft and moist and not dry at all so it was a pleasant surprise. The soup is what I guess most people enjoy, and I Love Pho’s soup is very good. It has a great flavour to it, but it isn’t too strong. For some it may be slightly ‘watery’ but I enjoyed it and after finishing my Pho (almost finishing anyway), I was extremely full and satisfied. I Love Pho knows what it does best, it hardly needs to change a thing as people arrive in droves. You can see why it is so popular on Victoria St, and a favourite of many as well. 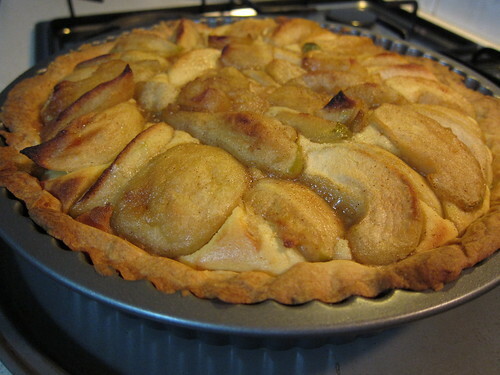 This Apple Tart is really quite delicious, I’ve taken it from this recipe book called Patisserie by Leonard J Hanneman. The shortcrust pastry is actually quite easy to make and comes out great too. The recipe is broken into three parts but all are manageable and not out of anyone’s experience. 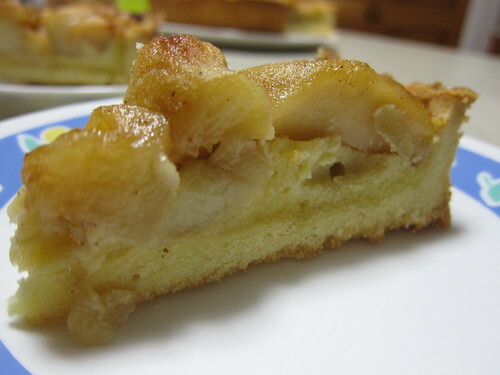 I recommend baking the shortcrust pastry first, then Apple Saute, and lastly the almond filling because the filling doesn’t require it to be cooled to room temperature. 1. Cream the butter and sugar lightly, using the paddle attachment. 2. Add the egg and continue creaming until absorbed. 3. Carefully fold in the flour and salt, mixing only until combined. The dough will be very sticky, and more like a biscuit paste. Wrap in plastic and chill prior to use. 4. Cut the chilled dough into manageable sized pieces, knead lightly first to soften, then roll out using dusting flour. 1. Take a chilled pastry case. For a quicker chill, the freezer works wonders. 2. Place a piece of non-stick baking paper into the pastry case, then line it with foil, pressing the foil flush with the base of the pastry case and up the sides. 3. Fill with baking weights of beans, ensuring that the weights press up along the sides to support the walls. There can be fewer weights over the centre of the pastry. It is important to have sufficient weights to support the sides as it is the sides that will slump as the pastry heats during the baking process. 4. Blind bake the pastry at 170°C for 30 to 60 minutes depending on the thickness and the size of the cases. 2. Melt the unsalted butter and add the vanilla pod (or cinnamon). Over high heat saute the apples in the butter and sprinkle over the sugar. Toss as they cook to a golden brown, though still firm. Do not overcook. Set aside to cool. 1. Cream the butter, sugar and almond meal, add the eggs and continue mixing until absorbed and the mixture is light and pale. 2. Spread the almond filling into the pre-baked and cold shortcrust shell/s. 3. Nestle the cool saute apples into the almond filling, wedges facing upward rather than fanned, to create height. 4. Bake at 170C for 50 minutes. Serve hot or at room temperature. I like this recipe because the shortcrust is nicely short and has a nice bite to it but overall it melts in your mouth like it should. The almond meal adds this grainy texture to the overall tart, however if you don’t like this more ‘whole wheat’ kinda taste then you can try food processing the almond meal a few times, and maybe sieve it as well so it comes out much finer. Overall it’s a good recipe that is easy enough to make, the only trouble you may have is with rolling out the pastry dough in a warm environment. It can get soft and unmanageable very easily. So if it does become too soft when you start rolling it flat and trying to place it into the case, either place it in the fridge or freezer to let it harden up a bit and try again. 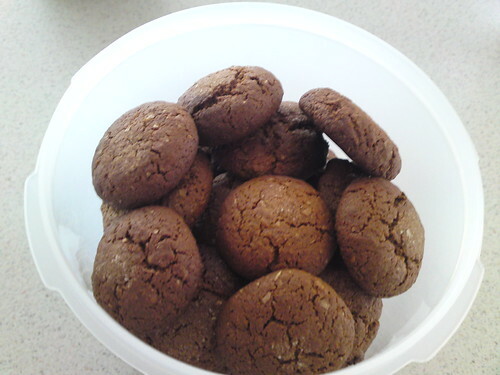 Ginger snaps or even ginger cookies are one of my favourite little treats. It’s quite funny though since I have a strong dislike for ginger in general, whether it’s raw, in a stir fry, congee, steamed fish etc. I found this recipe on Allrecipes.com a few Christmas’s ago and have made it a couple times now and I like it because it feels ‘healthier’ even though wholemeal/wheat flour isn’t really all that much better for you considering the other ingredients in these cookies. I’ve made a few changes as I didn’t have a few of the ingredients and to make it less sugary sweet. 1. Preheat the oven to 175 degrees Celsius. Grease cookie sheets. 2. In a large bowl, cream together the butter and 1 1/2 cups of sugar until smooth. Mix in the eggs, and then the molasses. Combine the whole wheat flour, baking soda, baking powder, ginger, and cinnamon. Stir the dry ingredients into the molasses mixture just until blended. 3. Roll the dough into small balls, and dip the top of each ball into the remaining white sugar. Place the cookies about 2 inches apart on the cookie sheets. 4. Bake for 10 to 15 minutes in the preheated oven, until the tops are cracked. Bake longer for crispy cookies, less time for chewy cookies. Cool on wire racks. I like this recipe because these cookies are nice and crunchy and you get a nice cinnamon and ginger taste that isn’t particularly overpowering. These cookies aren’t like your usual ginger snaps that are wafer thin and ‘melts-in-the-mouth’ since it doesn’t contain icing sugar and it has wholemeal flour for that grainy texture. Just a warning though, the cookie dough is extremely sticky because of the molasses so it’s quite difficult to shape but somehow they all turned out round.